After a few quick emails and a single phone call, the donation of 74 wheelchairs was set in motion. Advanced Home Care welcomed representatives of The Joni and Friends International Disability Center (IDC) to its corporate headquarters in High Point, NC on Thursday March 3, 2011 to donate the wheelchairs. The Joni and Friends IDC will distribute all 74 wheelchairs to Wheels for the World, an organization that collects, restores and then distributes free wheelchairs for children and adults in developing countries throughout the world. Janna Syester, Occupational Therapist for Advanced Home Care’s Concord branch noticed a call for wheelchair donations in Senior Grapevine – a community email bulletin she receives that is dedicated to senior-related activities and events in the Iredell County area. She sent an email to leadership in the corporate office to see if Advanced Home Care would be willing to donate any wheelchairs to Wheels for the World. 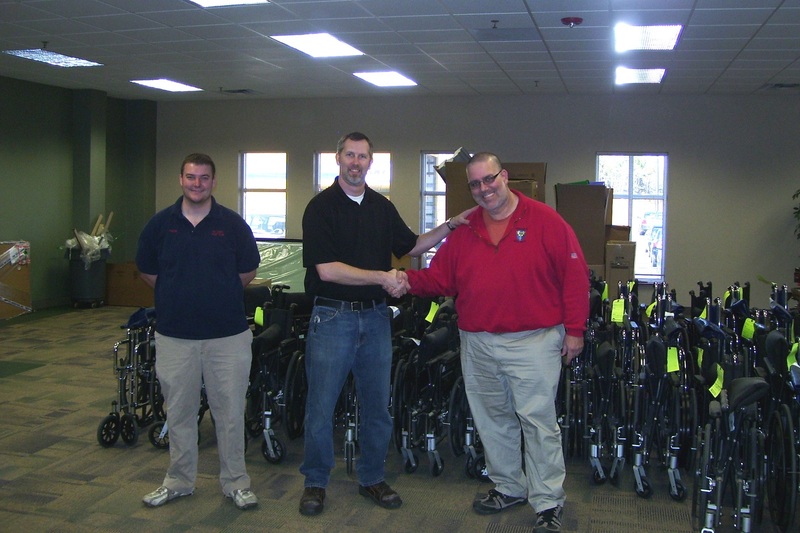 Advanced Home Care’s Warehouse Manager, Chuck Dreier, looked into his equipment inventory and identified 74 wheelchairs to donate to the cause. In a matter of days after notifying Janna, Chuck met with David Lanzer and Perrin Tysor from Joni and Friends to coordinate the delivery of these chairs. In keeping with this commitment, Advanced Home Care provided over $22.7 million of community benefit in 2010 within a four-state service area of North Carolina, South Carolina, Tennessee and Virginia. This community benefit included uncompensated care, corporate and employee donations and volunteer efforts totaling over 6,000 hours that contributed to the health and welfare of these communities.